Reliability is a combination of time ( no-delays, delivery exactly when required) and quality of the product. 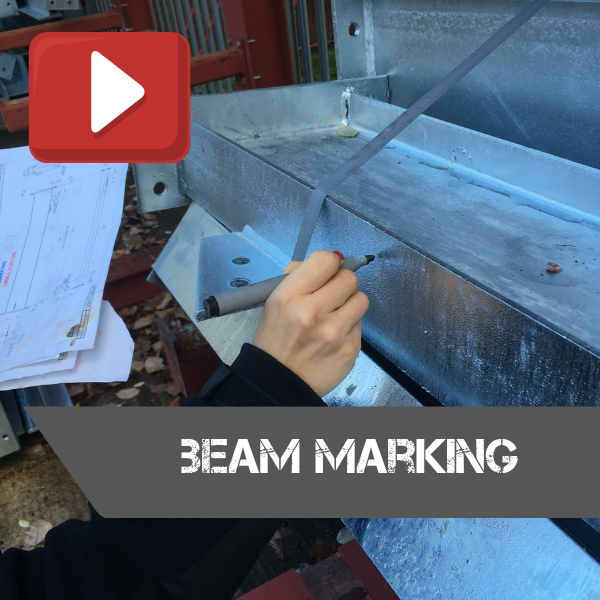 Watch our video and learn how beam marking helps us with achieving high-quality of our steelwork. We mark the raw steel material that goes to production. A marked beam then can be drilled, welded, coated. Last 3 digits of the project number. We mark the centre of gravity as it is easier to use overhead cranes in our production workshop or during offloading the beam later on site. The code name for the beam is produced by the software that our design engineers use for 3D detailing. Last 3 digits of the project number – all elements included in the same project (beams, flats etc.) are usually stacked together to make sure they will all go to the site with the same delivery. We produce drawings for every single beam that goes out from our workshop – including straight steel beams with no fabrication. Each drawing that goes to production needs to be signed, so it conforms with the CE marking. Fabrication drawings indicate any fabrication that is required, coating and other elements, that the production crew needs to be aware of. Previous Post Industrial heritage and transformation of the ‘steel heart’ Ostrava Next Post Is 3D printing the future of structural steel?